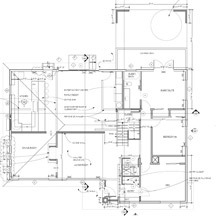 We are architects experienced with floor additions on single family residences. 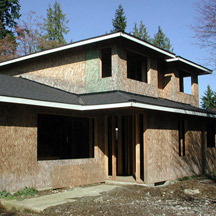 We put our experience to good use on the Harrison residence addition and remodel in Lynnwood, Washington. 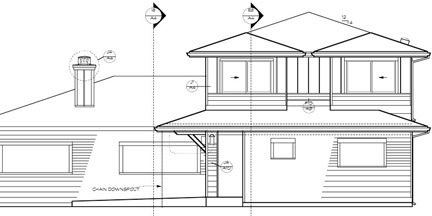 The existing house had a weak Prairie Style vocabulary which we appreciated and wanted to preserve as the house became taller. We also learned the owner appreciated this image, which is partly why they chose that house. 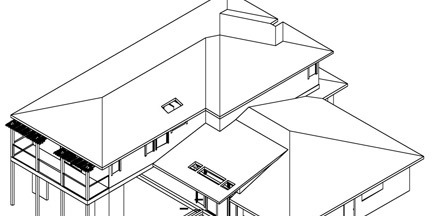 Our architectural design adds a floor to the building while maintaining and reinforcing the horizontal expression. The hip roofs and square bay windows reflect the Prairie theme, together with the belt line at the second floor window sill level. Major Considerations: Floor additions are always very expensive space. To help reduce the cost, we made the addition partly over the back yard, allowing easy access to foundation and ground floor structural wall work. There was a beautiful red leaf maple tree which had overgrown the sides of a concrete pot, surrounding it with roots, creating a very appealing image. The design ensured this maple tree would have generous access to light, air, & moisture following construction, and be a view accent from the covered downstairs deck. Unfortunately the foundation contractor damaged the tree and it did not survive.